The Yucca Mountain legislative battle came to an end on July 9, 2002, when the Senate voted 60-39 in favor of S.J. Res 34, overriding Governor Kenny Guinn's veto of the Yucca Mountain project. The House passed H.J. Res. 87 on April 25, approving Yucca Mountain with a margin of 306-117. The issue came to Congress in April 2002 after Nevada Governor Kenny Guinn vetoed President Bush's designation of Yucca Mountain as the nation's High Level Waste (HLW) repository. Bush, acting on the recommendation of Energy Secretary Spenser Abraham, approved the site on February 15. The House, after holding two hearings, quickly passed the H.J. Res. 87 with a large majority. The Senate held three Yucca hearings in mid to late May, but delayed vote on Yucca until after the 4th of July break. It was the aim of Senate Majority Leader Tom Daschle, D-SD, along with Senators Harry Reid, D-NV, and John Ensign, R-NV, to kill the Yucca Mountain project by not ever calling up S.J. Res. 34 to vote. According to the 1982 Nuclear Waste Policy Act, which was designed to fast-track the Yucca Mountain project through Congress, both the Senate and the House only had 90 days to override Governor Guinn's veto once it had been made. After that, Guinn's veto would stand – and the nation would be forced to look elsewhere for a solution to the nuclear waste problem. Daschle, true to his promise, did not to call up the resolution for consideration. However, in an unprecedented, though expected, move, Republican Senator Frank Murkowski of Alaska moved to open debate on Yucca Mountain. Reid and Ensign contested the move, arguing that it set a bad precedent to go against the Majority Leader. "This vote will make a loud noise and will change the way the Senate operates," Ensign said. 4 hours of spirited debate on Yucca Mountain followed. Reid and Ensign talked about the dangers of radioactive waste transportation and the risk of terrorism. "Al Qaeda doesn't need to buy nuclear material to smuggle a dirty bomb into our country; Congress is doing the hard work for them," said Ensign. He called the Yucca Mountain resolution "The Terrorism Facilitation Act." Several Senators agreed with the Nevada lawmakers. "We're going to rue the day that we authorized the movement of that much waste through that many states and neighborhoods," said Daschle. "Fundamentally, I want the waste out of Michigan," said Senator Debbie Stabenow, D-Michigan. "But I don't want to create more risks in the process." "I say to my colleagues, this is a moment of truth for every person here," Senator Barbara Boxer, D-California, said. "The things we do can come back to haunt us." But supporters of the Yucca Mountain project argued that the repository was necessary for the nation's health and security. They claimed the nuclear power industry would have nowhere to turn if Yucca Mountain were defeated. "Looking for another site . . . is not realistic. We're not likely to find a better site next time," said Senator Jeff Bingham, D-NM. "If we don't do this, do we go back to the beginning?" the Senate Republican leader, Trent Lott of Mississippi, asked at the close of debate. "The complications that would be caused, the irresponsible consequences of not passing this vote today, would be almost incomprehensible." At the end of the debate, the Senate held a roll call on the procedural issue. The motion to proceed passed 60-39. Ensign was one of three Republicans to oppose the motion to proceed. The others were Senator Ben Nighthorse Campbell of Colorado and Senator Lincoln Chafee of Rhode Island. Ensign had counted on Utah Senators Orrin Hatch and Robert Bennett, both Republicans, to oppose the motion as well. However, Hatch and Bennet announced the day before the vote that they would support Yucca Mountain. The announcement came shortly after a meeting between the two senators and Energy Secretary Spencer Abraham. Abraham told Hatch and Bennet that if the Yucca Mountain project were defeated, the nuclear waste could wind up in Utah at the Goshute Skull Valley Indian Reservation. "I would rather it pass through Utah than stay in Utah," Senator Bennett said. Fifteen Democrats, including Senator Patrick Leahy of Vermont and Senator John Edwards of North Carolina, also voted in favor of the motion. Most prominent Democrats, however, opposed the motion, including Senator Tom Daschle, Senator Joseph Lieberman of Connecticut, and Senators Edward Kennedy and John Kerry of Massachusetts. The Senate did not take a roll-call vote on the final resolution, but decided to use the procedural vote as a test. When it passed 60-39, S.J. Res. 34 was then put to a voice vote. Consequently, the resolution finalizing Yucca Mountain as a dump for 77,000 tons of the nation's nuclear waste was passed on a voice vote, relieving senators from having to defend voting on the record in favor of the proposal. Senators Reid and Ensign were disappointed, though not surprised at the outcome. They said their intense efforts to lobby their colleagues were overwhelmed by lobbying by the nuclear industry and the White House. "It feels like somebody has punched me in the gut about 100 times," said Ensign. "I feel very, very disappointed about the vote today." Now that the Yucca Mountain project has been approved by Congress, the next step will be for the Department of Energy to apply to the Nuclear Regulatory Commission (NRC) for a license to construct the site. The application is not expected to be filed before December 2004. However, despite Congressional approval, both the senators and Governor Guinn vow to continue the fight. "This battle's not over," Reid insisted. "This is a skirmish in a war." Reid, who sits on the Senate Appropriations Committee, pledged to slow the project by squeezing its budget each year. He is also chairman of the Senate subcommittee that oversees the NRC, which in a sense gives him oversight of the review process. He vowed to be a "more aggressive" NRC watchdog in the approval process. The State of Nevada has also filed five lawsuits over the past year to stop the Yucca Mountain project. Governor Guinn thinks Nevada will fare better in Court than it did in Congress. "Now the process moves to the federal courts, where the playing field is level and Nevada's factual, scientific arguments will be heard by impartial judges." Guinn says he is "highly confident that Nevada will prevail." Click here to read the Congressional Testimonies in full, including statements by Governor Guinn, Senators Reid and Ensign, and Energy Secretary Spencer Abraham. 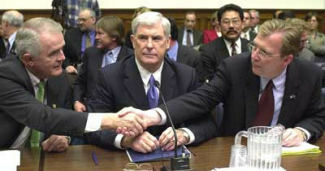 U.S. Representative Jim Gibbons, R-NV, Governor Kenny Guinn, and State Senator Jon Porter, R-Henderson at a Congressional Hearing. July 23, 2002 -- Bush Clears Way for Yucca Nuclear Waste Dump -- WASHINGTON (Reuters) - Brushing aside state safety concerns and objections from Nevada lawmakers, President Bush ( news - web sites) signed a resolution on Tuesday clearing the way for the burial of nuclear waste from across the nation in Nevada's Yucca Mountain. 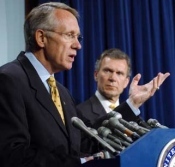 July 23, 2002 -- Reid takes bite out of Energy Department spending -- Nevada Democrat's committee unveils plan to cut nuclear waste disposal budget by 36 percent -- -- WASHINGTON -- Sen. Harry Reid took a fresh swipe Monday at the Yucca Mountain Project, proposing to cut the Energy Department's budget for nuclear waste disposal by more than a third. 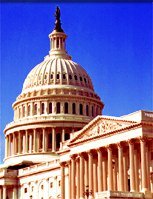 July 09, 2002 Congress OKs Nuclear Waste in Nevada -- (AP) -- WASHINGTON- The Senate voted Tuesday to entomb thousands of tons of radioactive waste inside Yucca Mountain in the Nevada desert, rejecting the state's fervent protests and ending years of political debate over nuclear waste disposal. July 09, 2002 -- Senate nears decision today on Yucca Mountain -- AP - Over the objections of Democratic leaders, Senate Republicans on Tuesday moved to force a vote on a proposal to send thousands of tons of nuclear waste for burial in the Nevada desert. Democrats immediately objected, setting up a pair of votes later in the day on whether to consider and approve a resolution overriding Nevada's veto of the proposed waste site at Yucca Mountain, 90 miles northwest of Las Vegas.